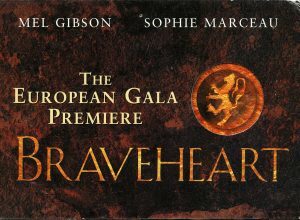 On the evening of Sunday 3rd September 1995 the University of Stirling experienced a taste of Hollywood glitz and glamour with the Macrobert hosting the European premiere of Braveheart, the historical epic about the Scottish hero William Wallace. The film’s star Mel Gibson was among many of the cast who attended the screening which took place in the shadow of the Wallace Monument. Such was the interest in the film that it was simultaneously screened in the Logie Lecture Theatre for university staff and students. It was after the screening that Stirling outshone Hollywood even more as thousands lined the route from the University to the Castle to cheer the 700 guests on their way to the after-show party under a shower of fireworks. 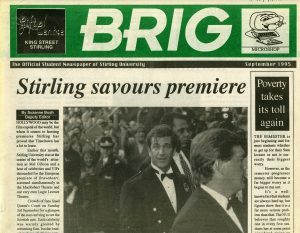 Cover of Brig, the University of Stirling’s student newspaper, reporting on the Braveheart premiere. The film went on to have a huge impact on Scottish culture and politics. The ‘Braveheart phenomenon’ is documented in a number of our collections, with the coverage of the premiere and the impact on the film on the local tourist economy being recorded in a file of press cuttings in the University Archives (ref. UA/A/6/8/1). Braveheart’s impact on the Scottish film industry is recorded in our Scottish Screen press cuttings collection, while its influence on the political debate in Scotland can be examined in our Scottish Political Archive.